Dental care for your horse is very important. Providing routine dental care addresses an important cause of weight loss and mouth pain in many horses. By removing painful points on the teeth and correcting chewing abnormalities, dental floatation can help horses maintain their weight, be more efficient with their chewing, experience a decrease in pain with eating and respond appropriately to the bit when being ridden. Here at Greener Pastures Veterinary Service, we are proud to provide the PowerFloat as part of our equine dental service. 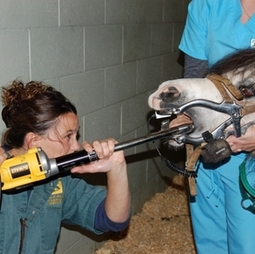 The PowerFloat is a tool (sold only to veterinarians) that is specifically designed for equine dentistry. Along with a proper dental exam performed under sedation with a dental speculum, the PowerFloat is a more effective, efficient and gentle alternative to simple hand floating. To ensure that your horse is not suffering from any dental abnormalities, we recommend that you have an oral exam preformed every 6-12 months.